Beat 1 1/3 cups of the flour and the remaining ingredients except oil and cinnamon-sugar in large bowl with electric mixer on low speed, scraping bowl constantly, until blended. Beat on medium speed 2 minutes, scraping bowl occasionally. Stir in remaining 2 cups flour. Cover and refrigerate about 1 hour or until dough stiffens. Heat oil (2 to 3 inches) in deep fryer or 3-quart saucepan to 375°F. Divide dough in half. Place half of the dough on well-floured cloth-covered surface; gently roll in flour to coat. Gently roll dough 3/8 inch thick. Cut with floured doughnut cutter. Repeat with remaining dough. Slide doughnuts into hot oil, using wide spatula. Turn doughnuts as they rise to surface. Fry 1 to 1 1/2 minutes on each side or until golden brown. Carefully remove from oil (do not prick surfaces); drain on paper towels. Sprinkle hot doughnuts with cinnamon-sugar. The key to perfect doughnuts is maintaining the oil temperature at 375ºF. Use a deep-frying thermometer for best results. Like your doughnuts completely coated? 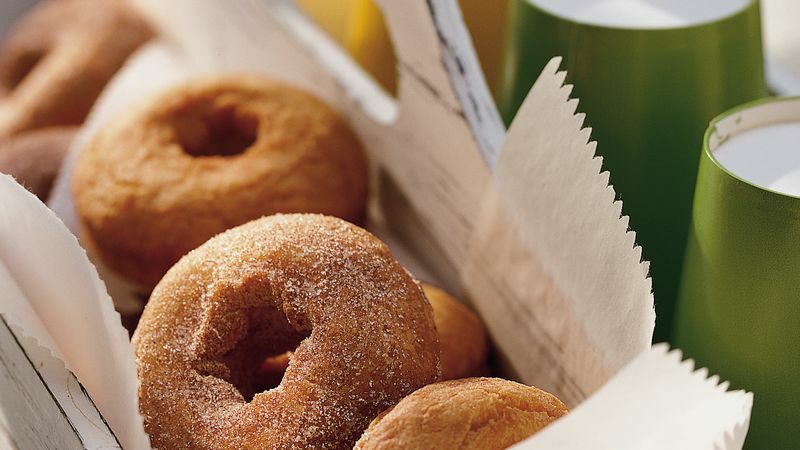 Add the cinnamon-sugar to a plastic or paper bag, and shake one or two doughnuts at a time in the mixture until coated.